Industrial networks run everything from outdoor utility plants to complex indoor manufacturing lines. Temperatures race up and down the thermometer, creating stress on the network components that run mission-critical operations. Ordinary devices that might perform just fine in a temperature-controlled office setting won’t hold up to the extremes of an industrial environment. Instead, trust Belden for the rugged, industrial-grade network components with a demonstrated track record of success in harsh environments. You’ll find a complete portfolio of options to meet any application challenge. Extensive lab testing proves that Belden cables maintain transmission quality even in extreme temperatures. These images show an ordinary Commercial-grade cable sample and a Belden Industrial-grade cable sample after exposure to heat or cold, replicating real-world operating conditions. Laboratory simulations of extreme high temperatures clearly show how Commercial-grade cable performs vs. Belden Industrial-grade cable. Exposure to high ambient temperature increases attenuation with Commercial-grade cables and can cause conductor insulation to melt, making termination difficult. 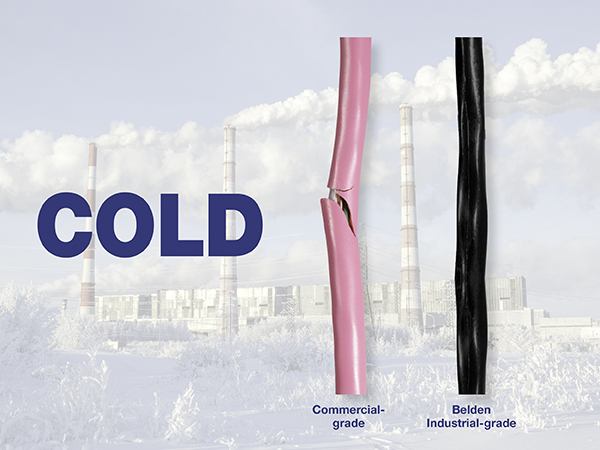 When tested for extreme low temperatures in a series of laboratory tests, Belden Industrial-grade cables clearly outperform Commercial-grade cables. Commercial-grade cables become brittle when exposed to cold temperatures. Damage typically occurs during flex, mechanical shock, and/or impact. While ordinary cable degrades significantly, Belden cable remains strong outside and inside. Your signal quality is protected. We guarantee it for 10 years. Belden offers the industry’s broadest menu of cable options, with temperature ratings from -70°C to +150°C. 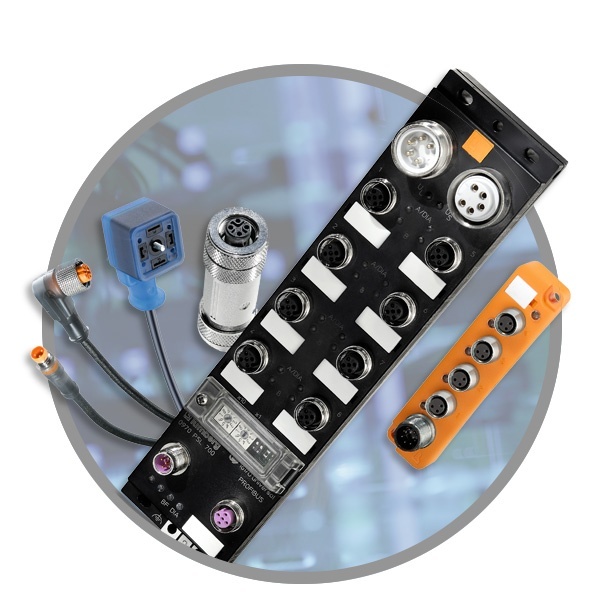 No matter if you’re using a newer EtherNet/IP, PROFINET or EtherCAT protocol or an older fieldbus or other serial protocol, don’t let temperature disrupt your connections. With ruggedized designs and hardened exteriors, connectivity products from Lumberg Automation and Hirschmann ensure that your network keeps you running strong. Lumberg Automation and Hirschmann have a history of premium quality connectivity products, with temperature ratings ranging from -40°C to +125°C. Hirschmann and GarrettCom active network components are temperature rated in the range of -40°C to +85°C, assuring you of long-term reliable performance. Extreme temps on either end of the thermometer can diminish functionality in switches, routers and wireless access points – whether fully exposed or in control cabinets. The external casing becomes brittle and fractures while internal parts simply stop working. Turn to Hirschmann and GarrettCom for active networking components specially designed and rated for resiliency, no matter how harsh the conditions. In the age of the Internet of Things, OT networks that were once closed and inaccessible are now exposed to more risk. It’s more important than ever to ensure not only edge security, but Layer 2 and Layer 3 security, too. With Tofino Security, Hirschmann and Tripwire devices and software, you can assess, monitor and protect your critical assets, even in harsh temperatures. The union of Tofino Security, Hirschmann and Tripwire provides a triple threat against serious and costly cyber events. Call 1-800-BELDEN-1 if you are located in North America or +49-7127-14-1809 if located in Europe. You can also fill out a short form to get support.